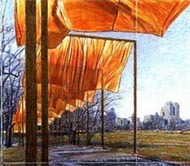 A much anticipated outdoor work of art, The Gates, conceived by the husband-and-wife collaborators Christo and Jeanne-Claude, was unfurled in Central Park on the morning February 12, 2005. 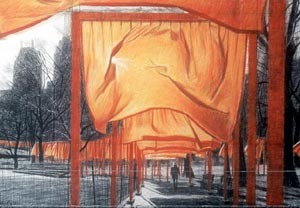 The project consists of 7,500 16-foot-high saffron-colored gates set up at 12-foot intervals along 23 miles of pedestrian walkways in the park. This project has been in process since 1979, and will remain in place until the end of the month.